It's times like these that I wish I had a video camera. 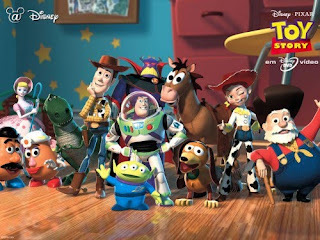 It all began when I was invited to go see Toy Story 3 with my sister and her kids. Logan had never been inside a movie theater so I had no idea what to expect. He was an angel. He parked himself on my mom's lap, got himself a lifetime supply of popcorn, and started shoveling buttery bits of popcorn for 2 straight hours. My mom thought he was asleep. What was mistaken for sleep was post-popcorn fatigue while basking in a larger than life wave of lights and colors from the movie screen. This boy was hooked. I first realized the obsession when we walked into Target and saw a gigantic sign of Buzz and Woody. I thought Logan was having some sort of fit. Nope. Pure joy at seeing his new best friends. I had to tear him away from the sign which only meant I had 15 minutes of complete toddler meltdown at Target. Then came Sam's Club. I saw that Toy Story 1 and 2 were on sale for $12. I thought they would make lovely Christmas presents for Logan. Think again. When I tried to take the movies from Logan he looked at me with fire in his eyes that said, "Over my dead body, Woman!" Since then he has probably watched Toy Story over 20 times. He sings (and conducts) to the introduction, he knows his favorite parts and screams at his not so favorite parts. When it is over he begs me to put in the second one. When I don't or when I interrupt the movie to, I don't know, FEED HIM, I know I have Toddler Hell to Pay. In the car today I put in a Disney CD that I had found and "You've Got A Friend In Me" came on. Oh, the joy!! He was ecstatic! It was as if Woody and Buzz were in the car with him! He "la-la-ed" the entire song. When it was over he screamed until I played it again. And again. And again. I now loathe that song. I know this should drive me crazy but it actually makes me really happy. He has his first passion. Now I can write in his baby book that when Logan was 2 he was OBSESSED with Toy Story. Sorry you have to deal with it, but it sounds so cute. I can totally picture him enthralled with his new best friends. At least he's obsessed with something decent, rather than Vege Tales or Barney or something. Maren is right, there are so many worse obsessions he could have. As a parent you want something you can enjoy too. My favorite with Jonah was when he was about two, he would belly laugh every time he watched the Blustery Day episode of Winnie the Pooh. He particularly liked when Owl's tree would sway back and forth and all the dishes fell on Piglet. Alternatively, I used to like the Little Mermaid - then I saw it three kazillion times, and well...the liking wears off. Good luck with Toy Story. Jenn, I remember you watching movies over and over when you were little..."Summer Magic" is one I will always remember! I am so glad he had such a good experience, we will have to do it again!